My biggest philosophy in personal finance is front-loading your life. But I’m not perfect. I’ve hinted at my first car purchase, but let me go into more detail about it. This single purchase probably set me back $10,000 to $20,000 more than it should have, at a time when I didn’t need to waste that money. It was about eight years ago, and if I had that extra $20,000, it could have easily grown into $25,000 or $30,000, if not more! That single transaction could have cost me $10,000 more today! Here’s my story of failure. Share yours in the comments! The bottom line was simple: I should have bought a used car, but I purchased it new. But I had just graduated college and I had a good-paying job. I wanted to reward myself. Prior to buying my new car, I had a beat-up old car. And before that car, I had a really beat-up and really old car. I’d never spent more than $10,000 on a car — which was smart. I didn’t need to spend more than that! My ego got the best of me, and even though I negotiated hard and purchased the new car below invoice, I still spent about $30,000 when I didn’t need to. And to pay for it? I had to take out a car loan. I could afford it, but I shouldn’t have done it. The loan was $718 per month, paying the car off in three years. On one hand, I’ve had the car for seven years without a single problem. On the other, I paid a lot for it when I didn’t need to. My point is, I should have waited a little longer after graduation to make such a big purchase and paid down my student loans instead. I was paying $718 per month on my car payment! I could have been paying that towards my student loans or saving for a house. Yes, I did achieve both of those goals, but it took longer. Or maybe I could have bought a more expensive house? Who knows. The point is, I failed at front-loading and it wasn’t the end of the world. It’s not the end of the world for you either. 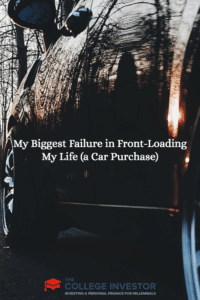 Have you failed in front-loading your life? Share your story below! It’s funny how finishing college suddenly makes us feel like a million bucks even though we don’t have it yet! Ugh…..This is the biggest thing I get criticized for. We have a $670 payment on our Chevy Traverse that we bought 2 weeks after our daughter was born – and traded in a 2013 Cruze on it……it was and wasn’t worth it. I love the space the car has, but hate the payment. We’re just trying to pay it off as soon as we can.